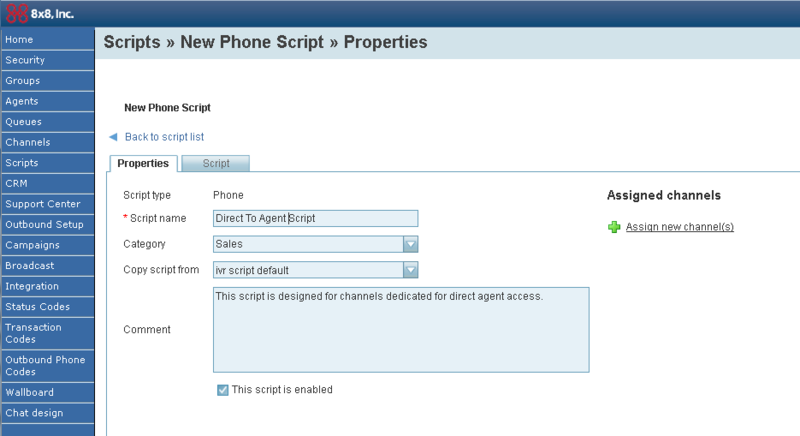 In the new 8.1 release, IVR Script is independent of the channel. A new tab, Scripts, is part of the Configuration Manager interface. The administrators can now create and modify scripts independent of the channels and associate them with channels as necessary. Scripts can be of type Phone, Email and Chat. You can create a script of any media by clicking the corresponding link in the scripts main page. In Configuration Manager, navigate to Scripts from the navigation menu. Create a unique script name. This field is mandatory and cannot be empty. A drop-down menu displays the list of categories. The category can be empty or the user could be allowed to create one on the fly. You can copy the script from or link it to an existing script. Note: Copy script is only associated with the content of the script and does not affect the properties of the new script. Select This script is enabled. The script can be used in IVR without being associated with a channel. Assign New Channels if desired. Click Save to go to the script tab. Click MainIVR. The [add] link appears. To design Email and Chat scripts, select Email or Chat and then follow steps 3 to 12. 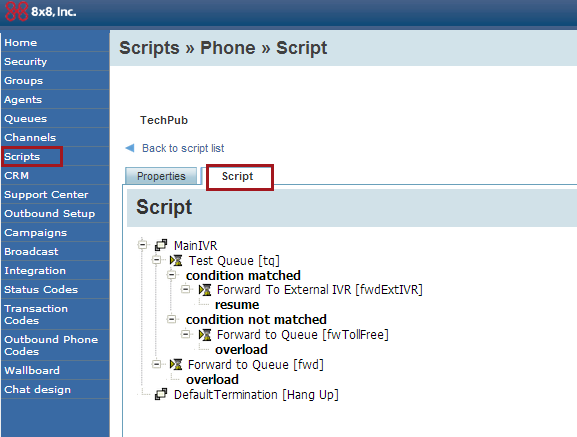 For detailed overview of IVR scripts, refer to Interactive Voice Response.